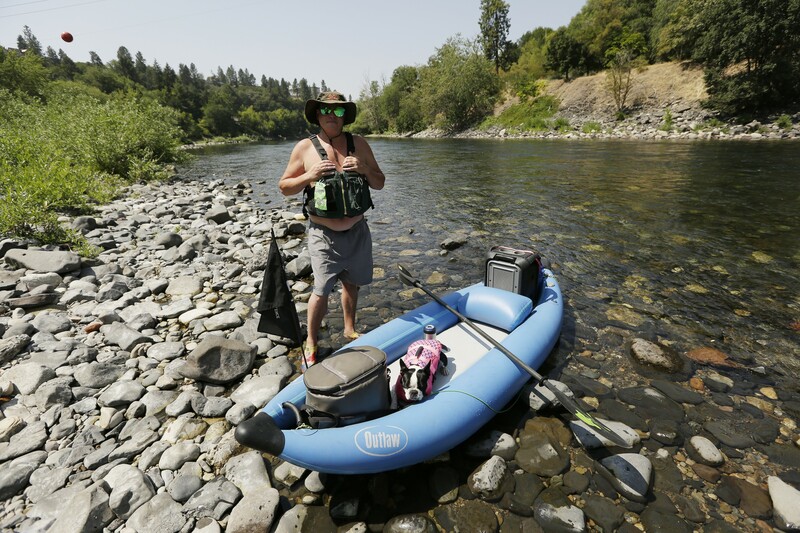 Shain McPherson floats the river nearly everyday to escape his "dry land" problems. 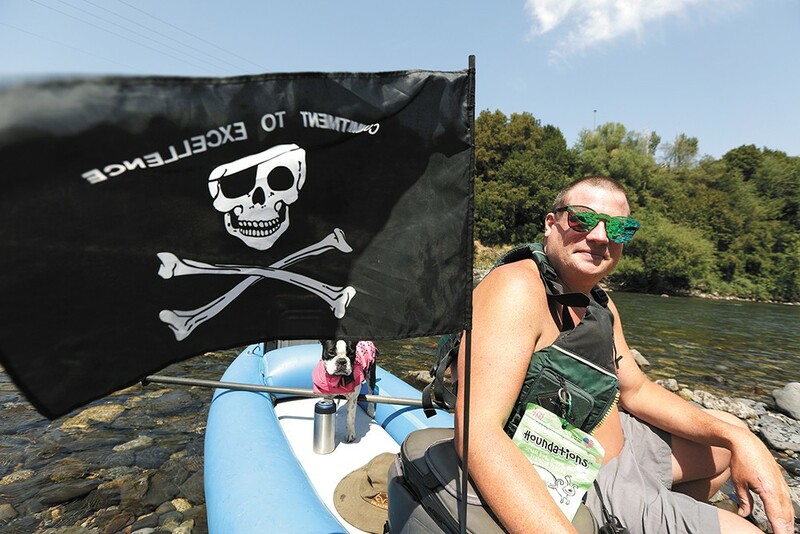 Anyone who spends much time floating the river knows the Spokane River Pirate. Maybe you just know him as That Guy With a Flag — a black flag with a skull and bones that sticks up from his inflatable kayak. But many know his real name: Shain McPherson. He's been floating the river for decades, and lately he's gone out just about every day. Of course, he's not actually out there to pirate — the pirate thing was always a joke. He's there to escape. "Coming down here, all my dry land problems stay up there on dry land," he says. "It doesn't feel like you're in the city, it just feels like you're out in nature." That, and his longtime girlfriend only lets him drink while he's on the water, he says. On a hot, 90-degree day, McPherson, 40, pulls up to his favorite launching point in Peaceful Valley in his old Jeep Wrangler. He wears water shoes, dark green shorts and no shirt. The hood of his car creaks as he lifts it up and connects his kayak pump to the car battery. Some friends meet him at the launch point — they've been floating with him for years, though nowhere near as often as he does. Just about every time he goes out on the river, he sees people he knows. Four years ago he started a Facebook group called "Spokane River Pirates." It's grown to nearly 400 people today. Most of the people he meets out on the water are good people, he says. Others throw their bottles and cans in the bushes or in the water. He hates that. In his cooler, the Pirate stuffs in Kokanee, Powerade and Smucker's UnCrustables. His dog, a deaf Boston Terrier named "Sweet Pea," hops in the kayak with him, standing next to a 2-foot-tall speaker. This summer, he's floated the river almost every day. But it never gets boring, he says. "I've never floated the same river. It's never the same water," he says. In the winter, he wears a dry suit to keep warm. His favorite time of year might be spring, when the water is high, because the water "makes you feel real small," he says. Depending on the day and the time of year, he spots all kinds of wildlife — deer, otters, eagles and moose. As he moves toward some rapids on a sunny afternoon, an osprey perches in a tree nearby. He flows past homeless camps. He waves at people on the shore playing with their dog. "This logjam up here is the first time I've ever seen a body," he says. It was a few years ago. He hasn't seen another dead body since. He continues on and marvels at the waterfront properties in Peaceful Valley. Through the years, he's seen new owners buy and renovate the same places. "But I hardly ever see any of the people actually use their waterfront," McPherson says, taking a sip from his Kokanee. McPherson doesn't work anymore, which is why he has so much time to spend on the river. Three years ago, he had a stroke on the beach after a float. He remembers how, that day, he couldn't use his legs properly. At first he thought it was a shot of whiskey he'd had earlier. But soon he realized he needed to get further down the river to a place he could get help. So he left his fate up to the river: He sprawled out in the water and let it carry him to safety, he says. The river takes care of people like that, he says. In all his years, he hasn't seen anyone get seriously injured. Even the guys floating through the rapids on inflatable "giant f—-ing flamingos" make it down OK, he says. The original print version of this article was headlined "Going With the Flow"